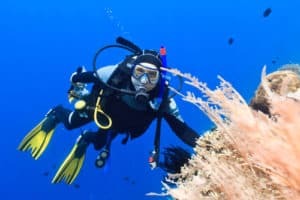 When selecting the right fin, you always need to remember the connection between the amount of energy and oxygen you use. This is quite notable in beginners who will have to conserve their energy and air more than the experienced diver. In this article, you will learn about the different types of fins there are available and when is the best time to use them. You will also learn about the different types of fin blades and how they work, so that when you purchase your first pair you will have all the information you need to make the right choice. 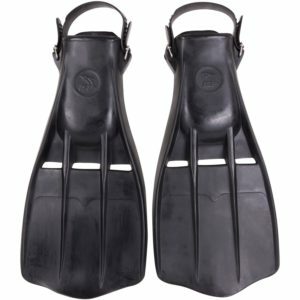 There is a wide selection of fins available, so you will have to take into account your level of expertise, your style of kicking, your leg power as well as what type of diving you plan on doing, to better decide which sort of fin would suit you best. 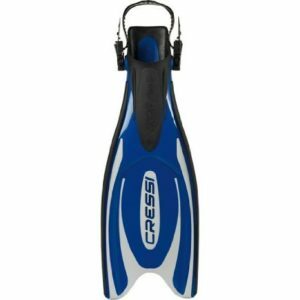 When you are looking for a new pair of scuba diving fins, your first consideration is which style of fin you want. Basically, there are two styles of scuba fin, the Open Heal Fin and the Full Foot Fin. The spot where you choose to dive greatly influences the type of fin you should opt for. 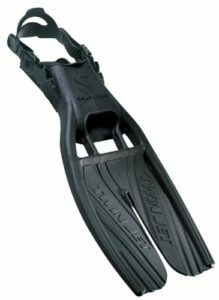 Open heel fins provide stability and maximum propulsion by creating less drag, as they have no dangling straps. They are more versatile, comfortable and adjustable than full foot fins are and they provide cushioning and protection from chafing, because you will need to wear a neoprene sock. Generally the open heel fins are nice to have in colder waters, as neoprene socks will help keep your feet worm. 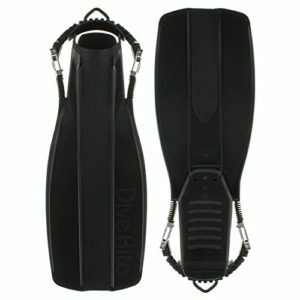 Full foot fins are far lighter and they are usually cheaper than the open heal ones. They are easy to wear and much less bulky. Should they not be a perfect fit, they will create a lot of blisters and pain for you. 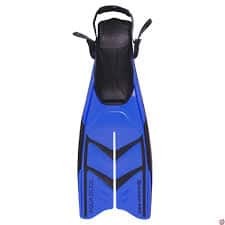 As you don’t wear full foot fins with booties, there’s no protection for your feet which allows the foot pocket to grip the to the foot, letting the energy flow more efficiently foot your foot to the blade of the fin. Scuba fins have certainly seen an evolution over the past few years, showing a blending of material and blade technology to better increase performance while drastically cutting the effort required to propel your body in the water. 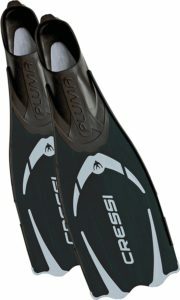 Paddle blade fins were around many years ago, with the new technology of split fin recently having been introduced to diving. The way split fins work is by creating a vortex is the water as you swim. Split fins cut the water creating nominal resistance; so as opposed to pushing up against water with force, the flexible blades create a lift and propulsion effect, not unlike that of the propeller on a boat. This basically means easier forward movement with far less effort, greater efficiency than what you get from paddle fins. Split fins cut the water creating nominal resistance; as opposed to pushing up against water with force, the flexible blades create a lift and propulsion effect, not unlike that of the propeller on a boat. This basically means easier forward movement with far less effort, greater efficiency than what you get from paddle fins. The split fin may be seen as more effective than paddle blades, but it has much less power. This is due to the fact that although split fins are easier to utilise under the right conditions, when those conditions change, there simply isn’t the same power in a split fin compared to a paddle blade fin. These are the simplest in design and generally have a flat blade surface. They work pretty much the same principle as an ore, propelling your forward with every kick cycle. Water spills over the sides of the fins reducing efficiently, creating turbulence which can make them unstable. Some manufactures use bungee bands, narrow sections in the blade and flexing bars, as well as standard or channel blades to create a more efficient pair of fins. The hinge in the blade allows it to move to the best angle of attack on the power stroke, which greatly improves performance. Fairly new to fin design, hinged fins have a point on the blade that hinges. With a pair of split fins, you are propelled through the water by “lift” created by water passing through the splits in the fins. This type of fin works similar to the wings of a plane or even boat propellers. Split fins have a split running down the middle of the blade with stiffer sidewalls for support. Unlike other fins that uses recoil to give thrust by pushing water backwards. One of the main concerns with these types of fins is that they can sometimes be hard to maneuver in tight areas. Also they are and are not ideal for use if you use the frog kick. 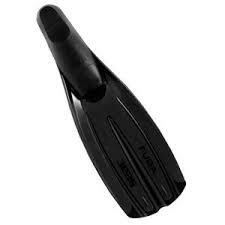 A split fin makes kicking the fins very easy and greatly reduces the load on your ankles and leg. Channel fins use different types of materials in the blade allowing it to flex along the width of the blade. This channel creates a focus “Jet” of water greatly increasing propulsion. When you kick, the fin form a “U” shape channel that captures and contain the water. Vented Fins are a step up from the standard fins. They are paddle fins that are vented at the base of the foot pocket. The vents allow water to pass through the fin during the recovery stroke of the kick cycle, and prevent water from passing during the power stroke. This reduces efforts during the recovery stroke increasing kick efficiency. Some vented fins are also designed to stream water over the length of the fins blade, which in turn increase propulsion. The simplest of design allows you to adjust the fin strap to suit your liking, by allowing you to either tighten or loosen the strap. 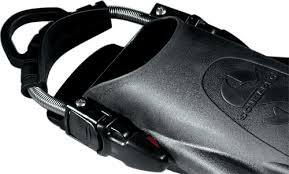 Fin Buckles and straps are designed to make putting on and taking off your fins as easy as possible. The tension from the spring or bungee keeps you foot snug and secure it the foot pocket. There is normally a loop in the back of the strap that allows you to pull the strap over your heel. It uses either a stainless steel spring or bungee to give the strap tension automatically. Spring Straps basically replace the robber strap and buckle system. In some cases the buckles themselves can be folded out, extending the straps so you can take off the fins, then folded back in place to restore the normal strap tension before your dive. Quick release buckles allows you to remove the fin strap from the fin with without having to loosen the strap, allowing you to keep your desired tension without having to make adjustments before every dive, saving you precious time. Open-heel fins are not generally sized by shoe size, but by bands (for instance, M, L, XL). Use this size chart to choose the right shoe size for you. A general rule of thumb when buying your adjustable open heal fins is to add one size up to leave room for your booties. When trying them on for fit be sure to do so with your booties on. When fitting full foot fins they should be snug, but not too thigh nor too loose, and should be sized according to your shoe size. 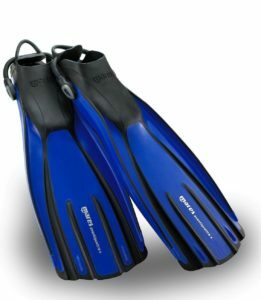 Many manufactures may size fins across a few sizes (For example, 8-9, 10-12), in this case your toes might stick out from the front of the foot pocket, this is perfectly fine unless it feels uncomfortable. If it does, then you should get the next size down. 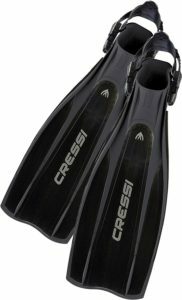 An extraordinary fin that makes the most of molding technology previously used only on the Cressi hi-tech models designed specifically for free diving and scuba diving. Pro Light is very powerful while easier to use than any other fin you can buy. It’s blade is highly flexible and requires less kicking effort. 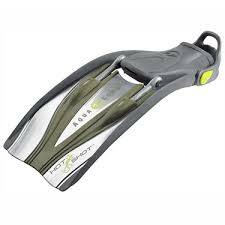 This is a newer model of fin which was made for those attempting diving for the first time. 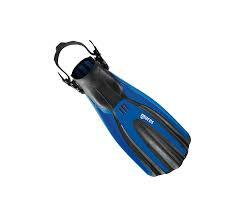 They are also ideal for those who plan to dive only on the odd occasion and are wanting to make long dives or kicks but don’t have any particular skills. Along the perimeter of the blade and on the adjustable buckle, there is a protective profile in e With their easy kick they are a pleasure to use, regardless of the user’s level of training. U.S. 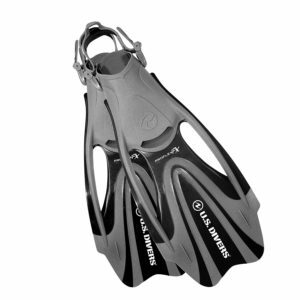 Divers offer a range of fin styles designed to meet water sports enthusiasts’ needs. Whether diving , body surfing, tube fishing, snorkeling, or just having a laugh in the swimming pool, the Proflex fin is amongst the best available. The Proflex features dual open water channels, optimizing the flow of water and enhancing the diver’s snap and thrust. IST have brought everything together in this all round fin; here we see power, propulsion, thrust, speed, style, and fit and at a great price. The specialised curvature of the blade and its tapered flexibility produce amazing thrust and flexibility, which is unheard of. Additional thrust is achieved through its 3 deep vents. The Quattro+ makes use of a 4-channel blade style, providing good efficiency and thrust, with Mares Hi-Flex, that gives the blades the additional advantage over its predecessor. This comfortable heel pad with its handy retractable pull tab makes it so easy to wear. The monoprene mix provides optimal balance between work and power, which means effective finning when in or heavy currents or high flows.